We take great pride in the personal and professional transportation services Ivy League provides. At Ivy League, the camp day begins from the moment your child boards an Ivy League bus. 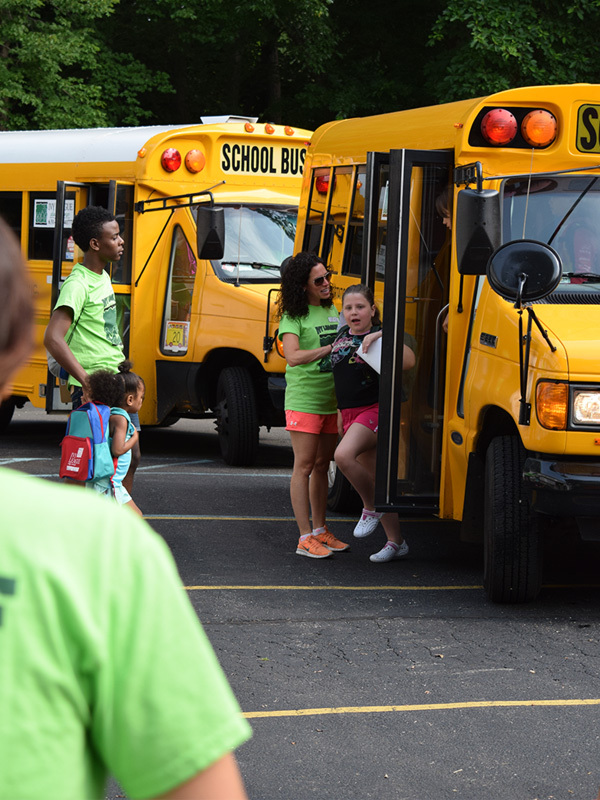 Our experienced professional bus drivers and capable, well trained bus counselors, work together as a team all season to ensure that your child has a fun filled and safe ride to and from camp. Transportation is included in your tuition. Ivy League provides door-to-door transportation on air-conditioned mini buses, all containing two-way radios, GPS, and are DOT inspected yearly. Bus drivers, many who drive school buses during the year, hold a CDL and are employed by the camp and not a bus company. We do not share vehicles, bus rides or drivers with any other camps. Our bus counselors ensure that your child’s bus ride is both safe and fun. Bus counselors will lead games, songs and exciting competitions to start and end the day with fun. With years of experience, we have developed efficient routing and safety systems which ensure that the most number of children have the shortest possible ride. With enough notice, we can handle special requests like separate pick-up and drop-off sites, transporting your child’s new best camp friend to your home or dropping your child off at your office. Each aspect of our transportation service is designed with your family in mind. Parents of Full Day campers can expect your child to be picked up in time for a 9:00am arrival and leave for home at 4:15pm. Mini Day campers have their own team of bus drivers and counselors. They are picked up after 9:15am and leave for home at 3:15pm. Parents may choose to transport their children to or from camp. So that you are not “caught” behind our buses, we provide you with a special drop-off and pick-up schedule. In lieu of transportation, Ivy League provides both a before and after camp program for the convenience of working parents. Children may be dropped off as early as 7:00am and be picked up as late as 6:00pm.